Maison, 3 chambres, 2 bains, 15 'x 30, SW face à la piscine. Nous sommes les filles des premiers propriétaires de Helen's Disney Dream Home-Chatham Circle et de Helen's Disney Dream Home -Brittany Lane. Nous nous engageons à poursuivre l'héritage de notre mère, qui consiste à fournir le meilleur hébergement de vacances possible à nos hôtes. Située dans un petit lotissement bien entretenu à côté d'un magnifique parc, cette maison de vacances de Kissimmee en Floride est l'endroit idéal pour se détendre en famille tout en profitant de toutes les attractions de la région. Cette maison est meublée pour fournir une maison confortable et paisible loin de chez eux. Tous les efforts ont été faits pour offrir aux clients des vacances des plus agréables. Notre maison de vacances se trouve à quelques minutes de Disney, des Universal Studios et de Sea World, de parcours de golf de championnat, de boutiques et de merveilleux restaurants. Cette maison de 3 chambres bien meublée, située à Kissimmee, peut accueillir jusqu'à six personnes. Le mobilier de salon et les matelas sont de haute qualité. Il y a des ventilateurs de plafond dans le salon et les trois chambres. En plus de la télévision dans le salon, il y a une télévision dans la chambre principale. Besoin de deux maisons? Nous avons également une maison identique dans le même lotissement avec les mêmes caractéristiques et commodités. Nous sommes deux soeurs qui s’efforçons de faire en sorte que nos invités aient la plus agréable expérience possible dans nos maisons. Notre piscine surdimensionnée a été construite sur mesure et a une exposition sud-ouest pour un maximum de plaisir au soleil. La chaleur de piscine en option est disponible pour une charge nominale. Le lanai projeté fournit le contexte idéal pour la vie en plein air et se détendre avec une table, un parasol, quatre chaises et trois chaises longues. La cuisine est entièrement équipée avec réfrigérateur, four / plage, micro-ondes et lave-vaisselle. La cuisine est équipée de vaisselle, verres, couverts et ustensiles de cuisine et dispose d'une table pour quatre personnes. Sièges supplémentaires pour six personnes dans la salle à manger du salon. La chambre principale ensoleillée donne sur la piscine. Un grand dressing, une salle de bains privative avec une baignoire de jardin et un dressing font de cette pièce un lieu de retraite privilégié. Un matelas queen moelleux, une commode, un garçon élégant et deux tables de chevet offrent beaucoup de rangement. La chambre 2 dispose d'un double matelas moelleux et d'une commode avec table de chevet. La troisième chambre est meublée avec deux lits jumeaux confortables, une table de chevet et une table. Pour les familles voyageant avec de jeunes enfants, il y a un berceau avec draps, poussette et chaise haute. La piscine a été construite sur mesure et est considérablement plus grande que les piscines de taille standard. Ajoutez à cela l'exposition sud-ouest et c'est un endroit idéal pour se détendre. Notre fantastique piscine peut être chauffée pour une somme modique. La véranda écran inclus fournit le fond idéal pour manger en plein air et bronzer. La véranda et la piscine projeté fournit la vie privée et la liberté d'insectes. Cet espace de détente est équipé de chaises longues, d'une table pour parasol et de chaises pour la détente. Option chauffage à la piscine à 18 $ par jour. En plus de votre piscine privée, il y a aussi une piscine communautaire et une cabane pour votre usage. Veuillez noter: semaines de vacances, mois de réservation de sept nuits minimum de février, mars, avril, juin, juillet et août Frais de nettoyage de 75 $ évalués sur toutes les réservations. What a spectacular place to stay. The location was amazing- so close to everything and yet lovely and quiet. only a few minutes to the bright lights of the 192 and yet only the sound of the occasional helicopter or airplane when sat by the pool. We even popped round to the children's area in the community park and saw the alligator in the lake. Neighbours would say hello. So comfortable. We really did come to think of it as home. Really worth paying for the pool heating too- it made such a difference. We have made some amazing family memories in this stay- after years of swimming lessons and it not going anywhere, it was in your pool my son finally swam! Thank you for everything. We just returned from a week in Patricia's fantastic Kissimmee home. The house is exactly is pictured and reviewed and is the perfect place to relax and unwind for the entire day (love the pool) or after a busy day at the parks. 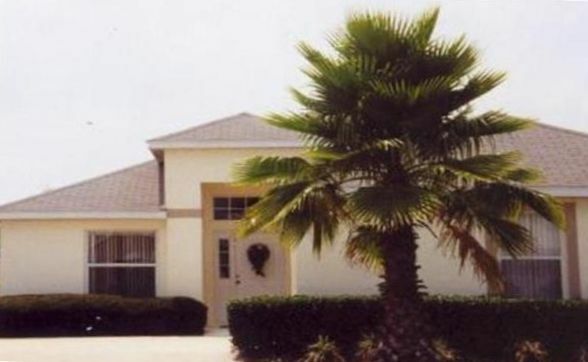 The home is very clean and with easy access to Kissimmee, the parks and Orlando. We paid the additional fee to heat the pool and it is well worth it. The pool was the perfect temperature for day or night swimming. The home itself has everything you need (although pizza pans would be a recommendation!) and is very well equipped. Patio furniture is comfy and towels were provided for both indoor and pool use (which is a great plus). Patricia was lovely to deal with for booking and the refund for damage deposit was returned promptly. I will absolutely book this property again (hopefully next year) and would absolutely recommend this to others - you cannot go wring booking this home and I would expect that their other property down the street is of equal standard. One thing I would recommend (not needed but to protect the carpets from damage) would be a small rug inside the patio doors so wet feet don't damage the carpet over time (we laid down a dark towel when at the pool to wipe feet on when entering home). All in all - a fantastic vacation and vacation home!! Charming little house located in a quiet community. This is truly a "home" with the amenities and conveniences that are often overlooked such as scissors, a roll of tape, an extension cord, etc. The pool is well maintained and was plenty warm (w/paid heating) for swimming even during (Florida) winter weather. Check-in and out were simple. The owner responded quickly and was helpful as needed. Much closer to the Disney parks than I had anticipated. Great value for the price. Great location for Disney Parks! We really enjoyed our vacation. We were within 10 miles of all the Disney parks. The house was very spacious and clean. Patricia was very accommodating and responded immediately to our concerns. This was a great house for our vacation. It was only a short drive to Disney and some Outlet Shopping, and there was a Walmart not too far away. The house was clean and the furniture comfortable! We did not use the pool since it was a bit too cold, however it looked very clean and would definitely use it in warmer weather. The neighborhood was nice, great for walking our dog. Check-in and check-out was fast and easy. We would absolutely stay here again! The home is and has obviously been taken care of and is very clean and well setup. Owner was extremely helpful and very prompt in responding to questions about the property. Would highly recommend renting this home for your vacation. Close to ammenities and highways. Full refund if cancellation of thirty days or more or if property is re-booked for dates. Should cancellation be within thirty days of arrival, all funds paid will be applied to future travel date. Fully refundable security deposit: $200 or $250 with pets. Only canine guests are allowed, limit is two with owner approval. For monthly bookings, $300 deposit required with balance due 45 days prior to arrival. Pet security deposit is $50 additional. Fully refundable within 5 days of check out. Security deposit of $200 without pets, $250 with pets. Sorry no feline guests due to allergies. Security deposit is in the form of a separate check and original check is returned to guest within 7 days of check out. CLEANING FEE OF $75 ON BOOKINGS OF LESS THAN 7 NIGHTS.